Need a crash course in what a facelift involves? Look no futher than our handy guide. Facelifts are a cosmetic procedure used to address aging around the face. Typically this means the tightening of sagging skin, but often facelifts are performed in conjunction with other procedures such as blepharoplasty (eyelid surgery) or a necklift, or the injection of fat or fillers. 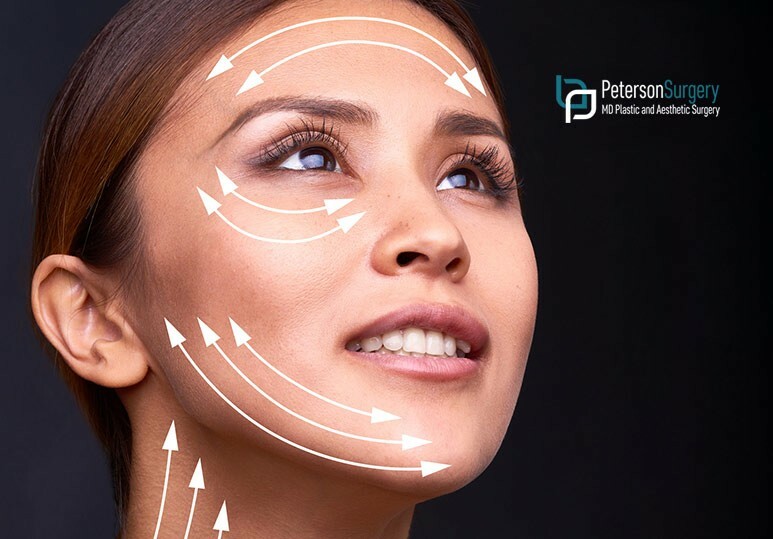 When deciding to have a facelift, it can help to know what to expect from the procedure, so here at our Kelowna plastic surgery clinic we’ve put together a primer. You will either receive intravenous (IV) sedation or general anesthesia prior to your facelift. Your surgeon will discuss the best choice for you. The amount of size of incision sites will depend on what exactly you are having done, whether a traditional facelift or a limited incision facelift (a “mini”). If you have elected for additional procedures they may be done consecutively or simultaneously depending on what is being done. Cuts are typically made at the temple, along the hairline, and around the ear. A mini will stay at the temple and around the ear rather than up the hairline. If you are having a necklift done as well, another incision under the chin may be made. Once the incision is made, the actual “lift” happens. Fat is redistributed or removed and then the underlying tissues (and often muscle) are lifted and repositioned to drape over the new contours. This is typically the SMAS layer of the face, which contains fascia (a band or sheet of connective tissue), ligamentous support structures and the muscles of facial expression. Excess skin is trimmed. Once in place, the incisions are closed. This could be at a new edge where skin has been trimmed, or the original incision. The skin will not be stretched tight, despite misconceptions about facelifts. Because the procedure addresses loose skin and sagging, the removal and movement returns the skin to a non-loose state, not a tight one. Closing the incision too tight could cause issues with scarring. Options for sealing include sutures (stitches) or skin glue. There may be some scarring but it is typically hidden in the hairline and the natural lines of the face. If nonabsorbable sutures are used, they typically remain in for one week. Often a bandage will be placed around the face to protect the sutures and minimize swelling. Small tubes may drain blood and fluid to help healing. Typically the bandage includes a support garment around the head and chin with cotton underneath. It should not be too tight and is removed the following day. Sometimes an intravenous dose of antibiotics will be given during the surgery to help prevent infection. You should be able to take standard painkillers after the surgery. Because facelifts can be done in a surgical care facility or outpatient suite, overnight stays are not typically required unless your health requires it for monitoring. Some patients may choose to stay in a suite for comfort and to facilitate healing, as they know they will rest and have nurse supervision, but it is not necessary. Your surgeon will give you specific instructions on how to care for the site and drains and when to follow up. Make sure to ask about your recovery period, such as when you will be able to do different things like wear makeup or wash your hair, as some specifics can vary. If you’re interested in a facelift, contact our leading Kelowna plastic surgery clinic to discuss your options, or call 250-868-9099.